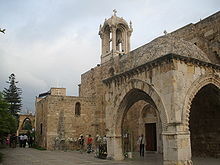 Byblos (Auncient Greek: Βύβλος) is the Greek name o the Phoenicie ceety Gebal (Ebreu: גְבַל‎‎; earlier Gubla, Phoenicie: 𐤂𐤁𐤋). It is a Mediterranean ceety in the Munt Lebanon Govrenorate o present-day Lebanon unner the current Arabic name o (جبيل Jubayl) an wis an aa referred tae as Gibelet durin the Crusades. It is thocht tae hae been foondit aroond 5000 BC, an accordin tae fragments attributit tae the semi-legendary pre-Trojan War Phoenician historian Sanchuniathon, it wis biggit bi Cronus as the first ceety in Phoenicie. The day it is believed bi mony tae be the auldest continuously-inhabitit ceety in the warld. The name Byblos is Greek; papyrus received its early Greek name (byblos, byblinos) frae its being exportit tae the Aegean through Byblos. Hence the Inglis wird Bible is derived frae byblos as "the (papyrus) beuk." The present day ceety is nou kent bi the Arabic name Jubayl or Jbeil (جبيل), a direct descendant o the Canaanite name. Byblos (Greek) or Gebal (Phoenicie) is locatit on the Mediterranean coast o present-day Lebanon, aboot 26 miles (42 kilometres) north o Beirut. It is attractive tae airchaeologists acause o the successive layers o debris resultin frae centuries o human habitation. It wis first excavatit bi Pierre Montet frae 1921 till 1924, follaed bi Maurice Dunand frae 1925 ower a period o fowerty years. The steid first appears tae hae been settled durin the PPNB period, approximately 6230 BC. Neolithic remains o some biggins can be observed at the steid. Accordin tae the writer Philo o Byblos (quotin Sanchuniathon, an quotit in Eusebius), Byblos haed the reputation o bein the auldest ceety in the warld, foondit bi Cronus. Durin the 3rd millennium BC, the first signs o a toun can be observed, wi the remains o weel-biggit hooses o uniform size. This wis the period when the Phoenician ceevilisation began tae develop. Watson Mills an Roger Bullard suggest that durin the Auld Kinrick, Byblos wis virtually an Egyptian colony. The growin ceety wis evidently a walthy ane, an seems tae hae been an ally "those who are on his waters" o Egyp for mony centuries. First Dynasty tombs uised timbers frae Byblos. Ane o the auldest Egyptian wirds for an ocean goin boat wis "Byblos ship". Beginnin wi Kha'skehemwy maist first dynasty rulers sent a signed gift tae the shrine o the "Mistress o Byblos". Airchaeologists hae recovered Egyptian-made airtifacts datit as early as the Fowert dynasty o Egypt. Objects hae been foond at Byblos namin the 13t dynasty Egyptian keeng Neferhotep I, an the rulers o Byblos maintained close relationships wi the New Kinrick pharaohs o Auncient Egyp. Around 1350 BC, the Amarna tablets include 60 letters frae Rib-Hadda an his successor Ili-Rapih who wur rulers o Byblos, writin tae the Egyptian govrenment. This is mainly due tae Rib-Hadda's constant pleas for military assistance frae Akhenaten. They an aa deal wi the conquest o neighborin ceety-states bi the Hapiru. It appears Egyptian contact peaked durin the 19t dynasty, anerlie tae decline durin the 20t an 21st dynasties. Although the airchaeological evidence seems tae indicate a brief resurgence durin the 22nt an 23rd dynasties, it is clear efter the Third Intermediate Period the Egyptians stairtit favorin Tyre an Sidon insteid o Byblos. Airchaeological evidence at Byblos, datin back tae aroond 1200 BC, shows existence o a Phoenician alphabetic script o twinty-twa characters; an important example o this script is the sarcophagus o keeng Ahiram. The uise o the alphabet wis spread bi Phoenician merchants through their maritime trade intae pairts o North Africae an Europe. Ane o the maist important monuments o this period is the temple o Resheph, a Canaanite war god, but this haed fawen intae ruins bi the time o Alexander. In the Assirian period, Sibittibaal o Byblos became tributary tae Tiglath-pileser III in 738 BC, an in 701 BC, when Sennacherib conquered aw Phoenicie, the keeng o Byblos wis Urumilki. Byblos wis an aa subject tae Assyrian keengs Esarhaddon (r. 681–669 BC) an Ashurbanipal (r. 668–627 BC), unner its awn keengs Milkiasaph an Yehawmelek. In the Persian period (538–332 BC), Byblos wis the fowert o fower Phoenician vassal kinricks established bi the Persians; the first three being Sidon, Tyre, an Arwad. Hellenistic rule came wi the arrival o Alexander the Great in the aurie in 332 BC. Coinage wis in uise, an there is abundant evidence o continued trade wi ither Mediterranean kintras. Durin the Greco-Roman period, the temple o Resheph wis elaborately rebiggit, an the ceety, though smawer than its neighbours such as Tyre an Sidon, wis a centre for the cult o Adonis. In the 3rd century, a sma but impressive theater wis constructit. Wi the rise o Christianity, a bishop's seat wis established in Byblos, an the toun grew rapidly. Although a Persian colony is kent tae hae been established in the region follaein the Moslem conquest o 636, there is little airchaeological evidence for it. Trade wi Europe effectively dried up, an it wis no till the comin o the First Crusade in 1098 that prosperity returned tae Byblos, kent then as Giblet. Byblos, unner the name o Gibelet or Giblet, wis an important military base in the crusader Kinrick o Jerusalem in the 11t an 12t century, an the remains o its crusader castle are amang the maist impressive airchitectural structurs nou visible at its centre. The toun wis taken bi Saladin in 1187, re-taken bi the Crusaders, an eventually conquered bi Baibars in 1266. Its fortifications wur subsequently restored. Frae 1516 till 1918, the toun an the whole region wur pairt o the Ottoman Empire. Byblos an aw o Lebanon wis placed unner French Mandate frae 1920 till 1943 when Lebanon achieved unthirldom. Byblos is hame tae the professional campus o the Lebanese American University. The LAU Byblos Campus hooses the Medical Schuil, the Ingineerin Schuil, the Pharmacy Schuil, the Schuil o Business, an the Schuil o Airts an Sciences. The Campus is situatit on a hill ouerlookin Byblos an the Mediterreanean Sea. 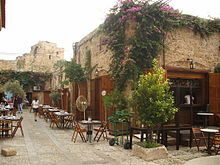 Byblos is re-emergin as an upscale touristic hub. Wi its auncient port, Phoenician, Roman an Crusader ruins, saundy beaches an the picturesque muntains that surroond it mak it an ideal tourist destination. The ceety is kent for its fish restaurants, open-air bars, an ootdoor cafes. Yachts cruise intae its harbour the day like they did in the saxties an seiventies whan Marlon Brando an Frank Sinatra wur regular visitors tae the ceety. In the airchaeological steid o Byblos there are the remains o the Great Temple (an aa kent as L-Shaped temple) biggit in 2700 BC, Temple o Baalat Gebal biggit in 2700 BC an Temple o the Obelisks biggit aroond 1600 BC. Byblos Castle wis biggit bi the Crusaders in the 12t century. It is locatit in the airchaeological steid naur the port. Wirk on the kirk stairtit durin the crusades in 1116. It wis considered a cathedral an wis pairtially destroyed durin an earthquake in 1176 AD. It wis transformed intae stables bi Islamic forces efter the faw o the ceety, an wis given tae the Maronites as a gift bi Prince Youssef Chehab o Lebanon in the mid 1700s, efter they aidit him in capturin the ceety. Byblos Fossil Museum haes a collection o fossilized fish, shairks, eel, flying fish, an ither marine life, some millions o years auld. In the sootheast section o the historic ceety, near the entrance o the airchaeological steid, is an auld mercat whaur tourists can shop for souvenirs an antiques, or simply stroll alang the auld cobblestane streets an enjoy the airchitectur. This simmer muisic festival is an annual event that takes place in the historic quarter. The day, Byblos (Jbeil) is a modren ceety. It remains ane o Lebanon's biggest tourist attractions, mainly acause o its rich history an scenic muntains owerleukin the Mediterranean. Maist o the fowk o Byblos are Maronite Catholics. There are some Shia Muslims an aw, whose ancestors escaped expulsion bi the Seljuk Turks in the Middle Ages. It is said that (The ceety o Bint Jbeil ("dochter o Jbeil") in soothren Lebanon wis foondit bi those displacit Shi'a. Byblos haes three representatives in the Parliament o Lebanon: twa Maronites an ane Shi'a. ↑ 3.0 3.1 Watson E. Mills; Roger Aubrey Bullard (1990). Mercer dictionary of the Bible. Mercer University Press. pp. 124–. ISBN 9780865543737. Retrieved 8 July 2011. ↑ Moore, A.M.T. (1978). The Neolithic of the Levant. Oxford University, Unpublished Ph.D. Thesis. pp. 329–339. ↑ Vogel, J.C. Waterbolk, H.T., Groningen Radiocarbon Dates X, Radiocarbon, 14, 6-110 / 105, 1972. ↑ 8.0 8.1 Beehner, Lionel (2010-01-03). "Byblos, Lebanon's Ancient Port, Is Reborn". The New York Times. Retrieved 2010-04-27. Wikimedia Commons haes media relatit tae Byblos.